Assistant Poor Law Commissioner Stephen Walcott visited Carnarvonshire prior to the formation of the Pwllheli union in 1837 and found that parish provision for the poor was limited with instances of a whole family trying to subsist on as little as a shilling a week. No parish workhouses were operating in the county. Caernarvonshire: Aberdaron (2), Abererch (2), Bodferin, Bodvean, Bottwnog, Bryncroes, Carngiwch, Ceidio, Crickieth, Denio (2), Edeyrn, Llanaelhaiarn, Llanarmon, Llanbedrog, Llandegwnigg, Llandudwen, Llanengan (2), Llanfaelrhys, Llanfihangel Bachellaeth, Llangian (2), Llangwnadle, Llangybi, Llaniestyn (2), Llannor (2), Llanystindwy (2), Meylltyrn, Nevin (2), Penllech, Penrhos, Pistill, Rhiw, Tydweiliog. The population falling within the union at the 1831 census had been 20,697 with parishes ranging in size from Bodferin (population 56) to Denio (2,019). The average annual poor-rate expenditure for the period 1834-36 had been £6,737 or 6s.6d. per head of the population. 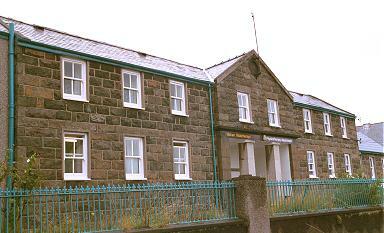 The Guardians had their first meeting on 8th June 1837 at the Crown Hotel in Pwllheli. John Lloyd was elected Chairman, and David Williams appointed as Clerk at a salary of £60 per annum. A second meeting at the Guildhall on 20th June appointed four relieving officers and for district medical officers. In September 1837, the Board were given leave to erect a workhouse for 220 inmates. On 13th December 1837, they agreed to buy a site at the west of Pwllheli known as Llain Gam from William Glyne Griffith for 500 guineas. The design of the workhouse was opened to competition and early in 1838, a design by William Thomas, of Penlon Street, Pwhelli, was chosen from a field of five entries. The building costs of the scheme were calculated to cost £2,769. A building committee was established in December 1838 to oversee the progress of the work. In February 1839, the first stage of work had been completed and the contractors paid an installment of £900. By August 1939, the work was almost complete and payment of a further £1,800 was authorised. The Pwllheli Guardians were notably out of step with their colleagues in the other Carnarvonshire unions who held out against the building of a workhouse for many years. The Bangor & Beaumaris union workhouse did not open until September 1845, followed by Carnarvon in 1846, while Conway delayed until the late 1850s. The location and layout of the Pwllheli workhouse are shown on the 1914 map below. The layout followed the popular cruciform or "square" plan. A entrance and administrative block faced onto the road at the south. This would probably have contained the boardroom where the Board of Guardians held their regular meetings. 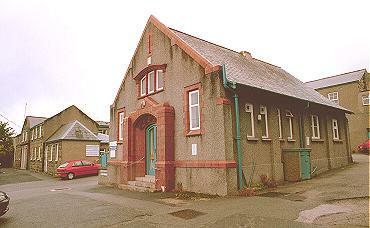 Pwllheli entrance block from the south, 2000. To the rear, accommodation wings for the different classes of inmates (male/female, infirm/able-bodied etc.) radiated from a central supervisory hub. The areas between the wings formed exercise yards which could be observed from windows in the hub. Pwllheli south-east yard and east wing, 2000. A chapel was incorporated at the south-east corner of the site. 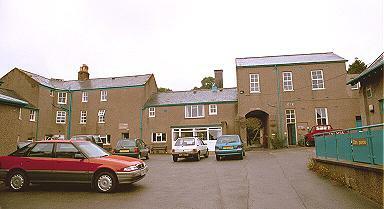 Much of the former Pwllheli workhouse site survives in the shape a local hospital. Caernarfon Record Office, Swyddfa'r Cyngor, Caernarfon LL55 1SH. Holdings include: Guardians' minute books (1837-44, 1847-1930); Admissions and discharges (1853-1923); Births (1853-1914); Apprenticeships (1877-1911); etc. Jones, Geraint (1992) Varchar, Nid Cartref - Hanes cynnar Wyrcws Pwllheli 1840-1890.